Sorry Sarah. I think we discussed doing a milkshake way back when I was collecting recipes. But ultimately I decided to do a smoothie. I couldn’t tell you why I did at the time. I thought maybe we would want something healthy. I thought maybe it would be for a breakfast treat as opposed to a Friday night snack. Really at this hour a milkshake makes more sense. Maybe we can do some switch out later in the month to get a milkshake going on. 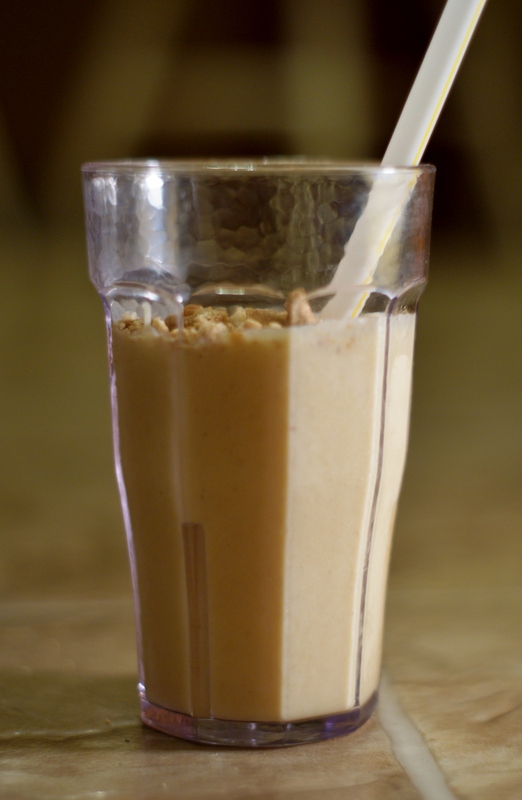 Tonight’s recipe is a slightly tweaked version of a Pumpkin Smoothie found at Pioneer Woman. It’s a very simple recipe so tweaks are easy to pull. Mine are in italicized parentheses below. Well ahead of time, place pumpkin into a freezer-safe container. Freeze for a few hours or until frozen solid. To make the smoothie, add milk, and yogurt to a blender. Drop in the frozen pumpkin and blend until the frozen filling is completely pulverized. (Don’t forget the cinnamon and sugar!) Add more milk or yogurt as needed to get it the consistency you’d like. You’re going to taste the Pumpkin in this one. My first sip I was a bit thrown off by it, but the more I drank the more I liked it. I imagine there are various ways to make it taste less like a squash. You could add more sugar, or more spices, or you could just say the hell with it and add a couple of scoops of ice cream and make that milkshake Sarah wanted. Tomorrow is MEGASURUS and a PUMPKIN CANNON at Maize Valley Winery and Sunday we are going to have Pumpkin Cinnamon Rolls. How can that not be awesome?